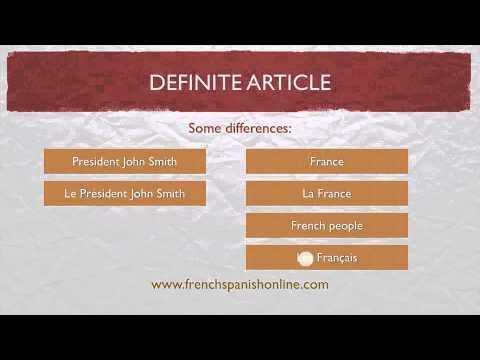 Unlike in English, definite articles (le,la,l',les) are used with titles, languages & academic subjects in French. Only in the phrase "to speak + [language]" can you use both forms, with or without le. Il parle portugais. / Il parle le portugais. "Je parle un peu d'anglais avec lui". Is this sentence correct when 'un peu' is used to modify 'anglais' instead of 'parler'? Yes , 'Je parle un peu d'anglais avec lui' is correct for, 'I speak a little English with him'. Hi - I am confused about how to tell is means the story or history (the academic subject). I chose story, but I don't understand how to know which is correct. Sorry, I used some punctuation which seems to have removed some of my question. I am confused about how to tell if "l'histoire" means the story or history (the academic subject). I suspect only context will tell you. History as opposed to Maths. Why is there no « de » after pas in this exam with languages? Is there not a rule « ne pas de »? How comes you don’t use « de » in this example: Ils ne parlent pas espagnol/ l’espagnol. ? Il n'y a plus de sucre. -- There is no more (of) sugar. But in the example you quote, "Ils ne parlent pas l'espagnol." There is no larger thing of which the language Spanish would be part of. It is an indivisible entity. Hence no "de". To complete Chris's answer, only partitive articles (du, de la, de l', des) and indefinite articles (un, une, des) become de or d' in a negative sentence. Je parle espagnol / l'espagnol. -> Je ne parle pas espagnol / l'espagnol. "ils" is given as the correct answer and "elles" is marked wrong. Why can't "they" be translated as "elles"? La difficulté est les mots "l'histoire" = story or the stories" et "l'histoire = history or the history". de plus, nous ne disons pas "The maths" plural as it relates to mathematics in English. The two test questions were thus very confusing. Can you please explain... Thank you. Merci Monsieur.... un bon réponse! Bonjour Dexter ! THE famous question :) Unfortunately, I cannot give you an infallible rule for that, as there is none. You just have to learn the words with their gender. The "good" thing is that words have a fixed gender, so once you know it, you can't get it wrong ;) À bientôt ! Susan asked: "When is the word "président" capitalized in French?" That's a very good question indeed! Le président Hollande visite l'Angleterre. - When you're addressing them personally, you will use what we call the "majuscule de courtoisie" (politeness capital letter). Good to learn the customs as well as the language. Merci! C. asked : "Why doesn't 'français' become 'françaisE' when it is about 'her' speaking French?" "A-t-elle parlé français ce soir ?" Bonjour C. ! The reason "français" doesn't agree in gender with "elle" here is that with the structure "parler + language", it is always the masculine form that is employed. Indeed here what you're actually saying is "I speak [the language] French", i.e. "Je parle français" OR "Je parle le [langage] français". Languages are always masculine in French, no matter who speaks them ;) I hope that's helpful! À bientôt ! Yes, thanks so much, sometimes the brain doesn't engage all the rules!